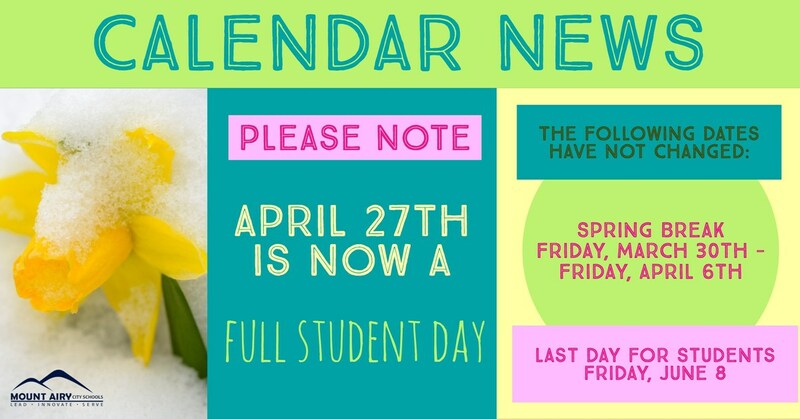 Due to inclement weather, Friday, April 27th will now be a full student day. Spring break and the last day of school for students have not been impacted. Click for the full details. 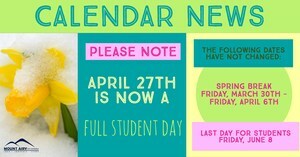 Due to inclement weather, Friday, April 27th will now be a full student day. Spring break and the last day of school for students have not been impacted. Spring break will be Friday, March 30th-Friday, April 6th. Students and staff will return on Monday, April 9th. The last day for students will be Friday, June 8.